This reusable bag is made of 100% recyclable jute fiber, and feature waterproof lining and reinforced leather handles. 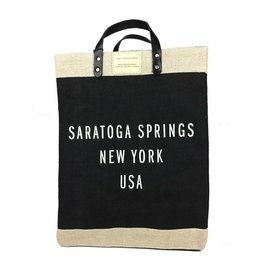 Lifestyles is a charming boutique nestled in the heart of downtown Saratoga Springs, NY on the corner of Caroline and Broadway. It boasts a relevant collection of women’s clothing, jewelry and accessories that appeal to customers of all ages.